Please see the attached Wildcat Monthly! The Clark County School District provides necessary supplies for all students in order to meet their educational needs. However, we know that sometimes parents choose to buy school supplies for their child and the following optional items would be appropriate for your child's grade level. 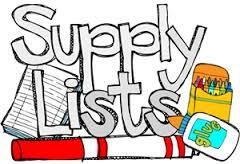 ​Please click on the button below to view the supply list. Our school hours for the 2018-2019 school year will be 7:50 a.m. and dismissal will be 2:01 p.m. Our school hours will remain the same for 2019-2020 school year.